Caroline tells Adam that he's being unreasonable - they never agreed that they weren't going to see other people. CAROLINE: It never occurred to me, Adam, that is was that serious! ADAM: Well, now you know. Adam wants them to make some sort of commitment, but Carline says if it comes down to a choice, she'll have to think about it. ADAM: Well, if you have to "think", I guess we're a long way from where I thought we were! CAROLINE: What are you getting so worked up about? ADAM: Simple! I'm not prepared to be left dangling, if Jim Robinson is, that's his problem. CAROLINE: Ada, you're being totally and utterly unreasonable. ADAM: Am I the one raging around with other people? CAROLINE: Going out with Jim is hardly raging around! But Christina comes in and interrupts them at that point, so Adam takes the opportunity to storm off. 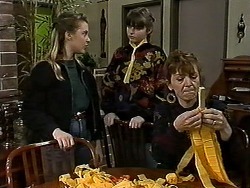 It's the first day of the school holidays and Cody and Melissa are moaning that they haven't got any money. Her pocket money has been stopped until Paul's fridge door is paid for! 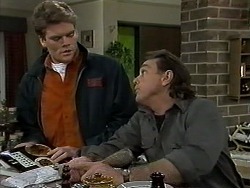 CODY: I'm grounded for life, just for wanting to be with Todd! PAM: No...no, for trying to follow him to Adelaide! Don't make it sound as if you just took a ride around the block, Cody, or I'll think you haven't learnt anything! CODY: I have, Mum, honest, but you don't know what it's like to be in love! PAM: No, no, of course I don't. I'm just a mother! CODY: There's still such a thing as cruel and unreasonable punishment you know! PAM: It's a tough life, alright. Melissa asks Pam if they can wander down the mall and do some window shopping. CODY: I don't get to look *in* windows anymore. I just get to look out of them. The sky, the trees, the people walking past...and wonder what it must be like to be free. Pam rolls her eyes and tells Cody that she's not going to make her feel guilty. Cody points out that it's been a week, but Pam points out Cody has spent the whole week moaning. But she does relent and agrees to talk to Doug later. 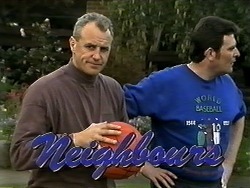 They chat about basketball and Cody moans that she isn't allowed to try out for the team - Doug thinks she's too young. Harold short-changes Des by mistake, he's still clearly distracted. Harold tells Madge and Jim that the TV people are coming around to do the interview about Kerry later. Madge and Jim are worried. 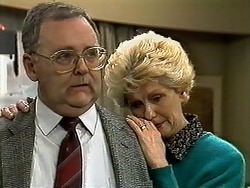 But Des says that maybe it will help Harold - make him feel that he's doing something positive to help Kerry's memory. Caroline is in a very bad mood and is on the phone to an employee called Linda refusing to change the roster so she can have the weekend off. Christina comes in and invites Caroline to lunch. She suggests that Caroline just makes up with Adam, but she says Adam is immature and unreasonable. She rants about how ridiculous Adam is being. She's not going to have any more to do with him, she says, but her face doesn't look convinced. Doug comes in and comments on how quiet it is. Pam says she's sent Cody to the shops to get some milk with Melissa. They chat about the basketball tryouts and then Adam comes in. He looks totally fed up and tells them that he's had a big fight with Caroline. ADAM: I told her she'd have to make up her mind - Jim or me. DOUG: My son, the diplomat! Pam tells Adam it'll probably blown over, but he doesn't think so. Doug, Pam, Melissa and Cody are having lunch. Cody is complimenting Doug at ever turn but Doug sees straight though this and tells her she won't talk him out of being grounded. Melissa asks if Cody can come around to her place this afternoon, but he refuses. They decide to go out to the garden instead. 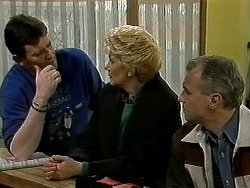 When the kids have gone, Doug tells Pam that he doesn't want Cody to go the same way Gaby did - he wants to be strict on her. He's sick of Cody constantly wheedling her way out of punishments. Harold is dressed in a suit and the TV people have set up their equipment. INTERVIEWER: Mr Bishop, your daughter must have been a woman of very strong convictions. INTERVIEWER: Did she ever indicate to you that she was fanatical enough to sacrifice her own life? INTERVIEWER: Her death has drawn attention to the very issues against which she was protesting. Might she have taken a calculated risk that simply went wrong? INTERVIEWER: How do they feel, do you think, about the man that shot their mother? How do you feel about him, Mr Bishop? HAROLD: Look, I didn't want to talk about this. INTERVIEWER: You lost a daughter. Her children have lost their mother. Surely you must have some feelings about the man responsible? HAROLD: Can we stop for a minute, please? INTERVIEWER: I'd rather we pressed on, it's going well - honestly. HAROLD: I didn't mean to get...I just didn't expect questions like this. INTERVIEWER: That's quite alright, you're doing fine. Cody moans about how bored she is, but Doug doesn't rise to the bait. CODY: I thought I might clean my room. PAM: You've already done that. CODY: Oh, yeah, first I'll mess it up again, and then I'll clean it! 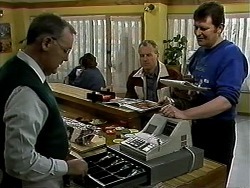 Cody offers to make ginger biscuits for Doug to "show him what a wonderful daughter she really is". HAROLD: See, Kerry was always like that. Even when she was a child. But the interviewer isn't very interested. INTERVIEWER: Thank you, Mr Bishop. HAROLD: You can't be finished! I haven't had a chance to tell you what she was trying to *do*! INTERVIEWER: I think we've got the general idea. HAROLD: Well, the general idea's not good enough, really! They reluctant sit back down. INTERVIEWER: Mr Bishop, could you briefly summarise Kerry's contribution to the community? INTERVIEWER: That's fine, Mr Bishop. HAROLD: But I want to say more! INTERVIEWER: Look, we're out of time. We've got a lot of ground to cover before we go to air, I'm sorry. INTERVIEWER: I do understand. But we're used to handling this sort of thing. I'm sure you'll be pleased with the coverage, Mr Bishop. Thank you for your cooperation. Cody presents Doug with ginger biscuits and says she'll get him a beer to wash them down. Pam says that Cody has also been helping around the house, and studying. Cody forces a biscuit into Doug's mouth and he says they're not bad. She goes on to say that she's got used to being inside and has decided to become a nun! Doug finally relents and tells Cody she's ungrounded and she hugs him excitedly. 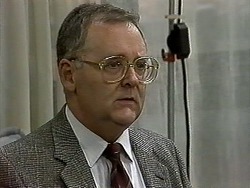 Harold tells Madge that he messed the interview up completely, but Madge says he did as well as he allowed. They have to look to the future now. Harold hugs Sky and realises she's right. Adam comes around to see Caroline, but only Christina is there. He asks her if he's got a prayer of patching things up with Caroline, and how serious things are with Jim. Christina says he'll have to sort it out with Caroline, not her. Pam, Doug, Des and Jim are ready to try out for basketball. Adam comes up and is very competitive with Jim. 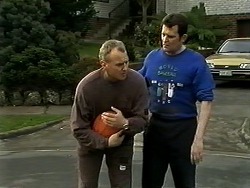 He throws the ball hard at Jim and winds him. Caroline sees this from a distance and rolls her eyes.